include replicas of the forts of Shivaji Maharaj. Shivaji Smarak will cover around 15 acres of area in the Arabian Sea. Shiv Smarak is proposed to be the tallest as compared to the Spring Temple Buddha statue in the China. The construction plan is expected to conclude in the year 2021. Some cost reduction measures were also adopted in the making of the Shiv Smarak. Earlier the project was costing a ₹4,000 crores but after the measures were adopted, the cost has been cut down to ₹2,800 crores. This Smarak will also have some exclusive specifications which are: a memorial garden, food court, visitor centre buildings, a library and a convention centre where around 10,000 people can be seated. 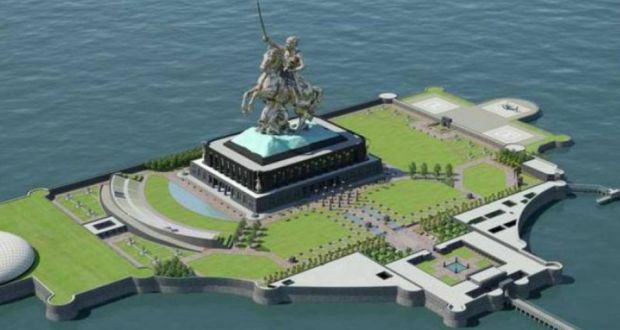 A museum, amphitheater, hospital, exhibition gallery and a helipad will also be included in this Shivaji Memorial. Does Shivaji Statue Mumbai is a Solar Power Project with RUPAR Technology? Shivaji statue is said to include Copper Indium Gallium, Amorphous Silicon and Cadmium Telluride in its composition. This material is used in making solar cells and the solar power thus generated from these cells will provide for ample electricity to supply to all the government offices in Mumbai city. The same viral message also says that the Indian government has consulted Dr. Immonen Kirsi, a Senior Solar Scientist at VTT Research, Finland and he along with his team has developed a technology after 2 and half years of research where using the solar cell material a statue can be created to produce enough electricity. The Shivaji statue will also include Radial Uniform Projection and Ranging (RUPAR) technology which will help in tracking boats in the Arabian Sea. This will avoid situations like 2008 Mumbai terror attacks when terrorists entered the Indian territory through the sea. RUPAR technology, developed at the Indian Institute of Science is the next generation of SONAR technology and using this hi – tech technology, the government aims at India’s security. The State Government might have received clearances from the Union Government and the environmental agencies to go ahead with the construction of the Shiv Smarak, but it is hard to believe that it won’t have a negative impact on the environment. measures are also suggested to protect the marine life. Environmental and disaster management experts have showed some major concerns regarding how the making of the Shivaji Statue can cause heavy damage to the Arabian Sea, marine life and people who earn livelihood from there. RTI says that heavy mining can be done to collect raw materials from these areas – Navi Mumbai, Kolhapur, Thane, Satara and Ratnagiri. A former chief scientist of CMFRI and a marine biologist named Vinay Deshmukh says that the proposed project does not include anything about the coping mechanisms in times of monsoon. The strong tidal currents arising in the Arabian Sea can lead to a big disaster by affecting the lives of the visitors. A proper and affective disaster management plan is required to cope up with any natural calamity. The foundation stone of the statue of the Maratha warrior king, Shivaji Maharaj was laid down by Prime Minister Narendra Modi in December 2016 where he performed a puja in the Arabian Sea. Post that, Chairman of the Chhatrapati Shivaji Maharaj Shiv Smarak Samiti (SSS), Vinayak Mete also performed some rituals in December last year to mark the beginning of the Shiv Smarak project. There were rumors of some changes being incorporated in the design of the statue but all such speculations were cleared by the head of the group which is implementing this project and looking into its progress. The statue will showcase the great Maratha king in his classic equestrian pose and no changes as such have been taken place in its design as of now. SSS Chairman, Vinayak Mete had said that it was expected that work on this grand project shall resume after February after the Supreme Court announces its final decision in the matter. The very famous sculptor, Ram V Sutar who earlier designed the Statue of Unity is the creator of the grand Shivaji Memorial and a 212 metre tall (pedestal included) sculptor is on the cards.